Authors: Abdullah-Al-Mamun, M. M., Masum, K. M., Motaleb M. A. & Sarkar, M. S. I. Authors: Islam, Sk. A. & Rahman, M. M.
Authors: Uchechuku, O. F., Azubuike, O. S. & Okon, E. N.
Abstract: Pretreatment of the seed shell of Pentaclethra macrophylla Benth was carried out using 0.3 mol of thioglycollic acid. Biosorption analysis was conducted using different variations in the initial metal ion concentrations (100, 80, 60, 40, 20, and 10) mg/l at pH of neutral point, room temperature, contact time of 1 hr using 1 gram of the 250 mesh size of both the untreated and treated Pentaclethra macrophylla seed shells. Biosorption capacity of Pentaclethra macrophylla seed shell was observed to be high with increasing higher concentrations of the metal ions in both treated and untreated Pentaclethra macrophylla seed shells though maximum concentrations of Cd2+ and Pb2+ sorbed were observed by untreated Pentaclethra macrophylla seed shell while Ni2+ was highly sorbed by the treated Pentaclethra macrophylla seed shell. Data gotten via study gave good fit for different sorption isotherms such as Freundlich, Temkin and Dubinin-Radushkevich (D-RIM). Multilayer biosorption with non-uniform distribution over the heterogeneous surface was observed and the biosorption of the metal ions onto untreated and treated Pentaclethra macrophylla seed shells was spontaneous and was consistent with the pattern of physical adsorption. Uchechuku, O. F., Azubuike, O. S. & Okon, E. N. (2015). Biosorption of Cd2+, Ni2+ and Pb2+ by the shell of pentaclethra macrophylla: equilibrium isotherm studies. Journal of Science, Technology & Environment Informatics, 02(01), 26–35. Uchechuku, O. F., Azubuike, O. S. & Okon, E. N. “Biosorption of Cd2+, Ni2+ and Pb2+ by the shell of pentaclethra macrophylla: equilibrium isotherm studies.” Journal of Science, Technology & Environment Informatics, 02.01 (2015): 26-35. Uchechuku, O. F., Azubuike, O. S. & Okon, E. N. “Biosorption of Cd2+, Ni2+ and Pb2+ by the shell of pentaclethra macrophylla: equilibrium isotherm studies.” Journal of Science, Technology & Environment Informatics, 02, no. 01 (2015): 26-35. Authors: Boateng, A. N. K. A, Diawuo, E. K., Adzaklo, S. Y., Awuvey, D. K., Agyei, P. N. K. N, Amoakohene, E. Y. & Kwaasi, E.
Abstract: Wall thickness monitoring is very critical of the process pipes and transporting storage vessels in the power and the petrochemical industries. This is to assess their corrosion and erosion rate since failure of such equipment is very catastrophic. In this study, the wall thickness of liquefied petroleum gas (LPG) storage vessels were measured by means of ultrasonic thickness gauge and the operating pressure (OP) of each vessel evaluated. The purpose is for routine monitoring and safety assessment to ascertain the integrity of storage and transporting vessels. The OP of each vessel was compared with the vapor pressure of tropical LPG and the integrity of each vessel inferred. The minimum and the maximum margins are 0.4 bar (0.04 MPa) and 5.6 bar (0.56 MPa) respectively. The safety implications of the results are also discussed for each vessel tested. The result shows that all the vessels are safe and fit for use. Boateng, A. N. K. A, Diawuo, E. K., Adzaklo, S. Y., Awuvey, D. K., Agyei, P. N. K. N, Amoakohene, E. Y. & Kwaasi, E. (2015). Ultrasonic thickness gauging as a means of evaluating integrity of liquefied petroleum gas vessels. Journal of Science, Technology & Environment Informatics, 02(01), 36–41. Boateng, A. N. K. A, Diawuo, E. K., Adzaklo, S. Y., Awuvey, D. K., Agyei, P. N. K. N, Amoakohene, E. Y. & Kwaasi, E. “Ultrasonic thickness gauging as a means of evaluating integrity of liquefied petroleum gas vessels.” Journal of Science, Technology & Environment Informatics, 02.02 (2015): 36-41. Boateng, A. N. K. A, Diawuo, E. K., Adzaklo, S. Y., Awuvey, D. K., Agyei, P. N. K. N, Amoakohene, E. Y. & Kwaasi, E. “Ultrasonic thickness gauging as a means of evaluating integrity of liquefied petroleum gas vessels.” Journal of Science, Technology & Environment Informatics, 02, no. 02 (2015): 36-41. Authors: Sultana, N. & Roni, R.
Abstract: A series of rainfall data over 48 years in the period 1966-2014 recorded at six different coastal regions in Bangladesh is modelled using extreme value distributions. In order to reduce destruction and loss of life and property, it is necessary to make proper inference about extreme rainfall. Generalized extreme value distributions (GEV) have been extensively used for this purpose. Fitting annual maximum rainfall according to the block maxima approach. Also generalized pareto distributions (GPD) are fitted to daily rainfall data considering peaks over thresholds (PoT) method. The return levels are the upper tail quantiles that expected to be exceeded once, on average in a given time levels also estimated for different return periods using both models. Assessment of the uncertainty in the estimates of return levels by constructing 95% confidence interval using both delta and profile likelihood methods but due to more accuracy, in this study only present profile likelihood estimate has been discussed. Sultana, N. & Roni, R. (2015). Rainfall modelling of coastal areas in Bangladesh: extreme-value approach. 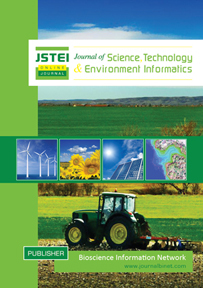 Journal of Science, Technology & Environment Informatics, 02(02), 42–50. Sultana, N. & Roni, R. “Rainfall modelling of coastal areas in Bangladesh: extreme-value approach.” Journal of Science, Technology & Environment Informatics, 02.02 (2015): 42-50. Sultana, N. & Roni, R. “Rainfall modelling of coastal areas in Bangladesh: extreme-value approach.” Journal of Science, Technology & Environment Informatics, 02, no. 02 (2015): 42-50. Authors: Nahar, N., Lanon, M. A. H., Saha, B. & Shaibur, M. R.
Abstract: The case study was conducted in 2014 to assess the physico-chemical properties of the water from the Gorai river in Kushtia, Bangladesh. To conduct this research, six samples from six points were collected from surface water of this river that covered only the Kushtia town. Samples were collected from Charulia, Barokhada, Jugia, Kamlapur, Thanapara and Ghoshpara at 1km interval. Another three samples were collected from Jagati sugar mill area and two domestic effluents those were discharged to the main river flow to evaluate the impact of these effluents on the river water quality. Different water quality parameters such as temperature, pH, Electrical Conductivity, Total Dissolved Solids, Dissolved Oxygen, Alkalinity, Hardness, Sodium, Potassium, Phosphate, Sulphate, Chloride, Iron, Lead, Cadmium and Chromium were examined. From this study it was observed that most of the parameters exceeded the permissible limits. Nahar, N., Lanon, M. A. H., Saha, B. & Shaibur, M. R. (2016). Assessment of physico-chemical properties of water of Gorai river at Kushtia town in 2014: a case study. Journal of Science, Technology and Environment Informatics, 02(02), 51–60. Nahar, N., Lanon, M. A. H., Saha, B. & Shaibur, M. R. “Assessment of physico-chemical properties of water of Gorai river at Kushtia town in 2014: a case study.” Journal of Science, Technology and Environment Informatics, 02. 02 (2016): 51-60. Nahar, N., Lanon, M. A. H., Saha, B. & Shaibur, M. R. “Assessment of physico-chemical properties of water of Gorai river at Kushtia town in 2014: a case study.” Journal of Science, Technology and Environment Informatics, 02, no. 02 (2016): 51-60.